LiveX uses traditional production equipment to create its programming, which is then distributed via the internet or VOD to the audience. In order to stay competitive, today’s video production companies have to do more than just produce video. They also have to deliver it to clients in the most efficient and comprehensive way so that it is viewed by the largest audience possible. LiveX has found internet distribution key to this goal. “There is a prevailing mood in media right now of being everywhere your audience is, and that means reaching them through their phones and on their social media applications,” said Rob Baynard, the studio's creative director. The Master Control Room at LiveX features a Blackmagic Design Atem 4K switcher. 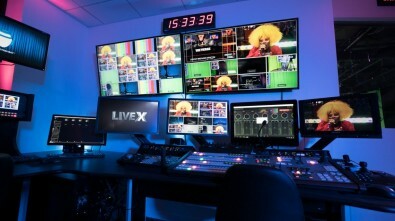 All LiveX shows are distributed using three Wowza Media Systems' products; ClearCaster, Streaming Engine and Streaming Cloud. An AWS Elemental 4K encoder is used to feed YouTube Live, and a Haivision KB Series Encoder for Periscope/Twitter. 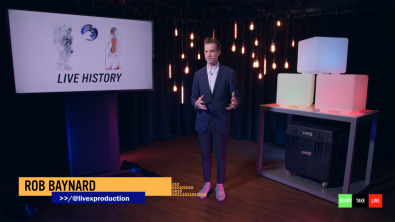 Streaming technology from Teradek and StudioCoast is also used as needed. 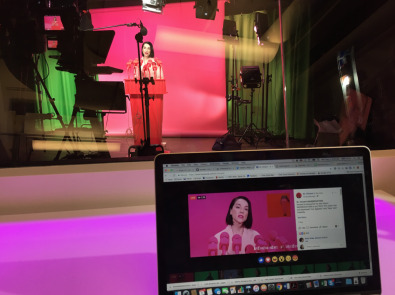 Pop artist St. Vincent announcing her new album "Masseduction" at the LiveX studios. The company’s services are supported by a plethora of top quality SDI production technology to create videos for clients like the U.S. Golf Association, DJI, Vox Media and Warner Music Group. 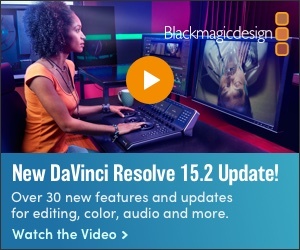 Its wide-ranging productions leverage a full complement of Blackmagic Design products—router panels, an ATEM 2 M/E production switcher, and several URSA Mini Pro 4.6K (with Canon lenses) and Micro Studio 4K cameras. Professional lighting comes from Litepanels and ARRI Media. The company created its own 4K graphics system and relies on a ClearCom Helix Eclipse intercom matrix to keep the crew connected. In keeping with its affordable mass-distribution-via-IP strategy, the company is also pioneering new ways to set up remote operations where the staff can control remote gear, which has been placed at live events. The workflow will save clients the operational costs of sending a crew and equipment to various locations. “We’re really preparing for the REMI [remote integration] future,” said Corey Behnke, a producer and co-founder of the company. Since 2009, He has successfully produced the official Times Square New Year’s Eve webcast for the Times Square Alliance and Countdown Entertainment. Indeed, keeping costs low is also why LiveX’s use of the Facebook Live platform has been so successful for them. “No other social platform API has the functionality, reach, analytics and targeting so completely packaged and easy to use as Facebook,” he said. “Our hope is that other platforms will learn from what Facebook is doing and incorporate some of these features into their own live streaming APIs. Rob Baynard hosts “Ready Take Live” a weekly online show produced live in house that is available via streaming or VOD. The encoder is easy to use with the engineer needing to just select “Paired Encoder” as the transmission method and the source shows up automatically. This makes streaming simple and ensures that the proper encoder settings are always being used. The power of social media is in creating an interactive dialogue that feels natural and brings the audience as close to the live event as possible. Leveraging the internet as its main distribution platform allows LiveX to provide clients with a real-time, engaged-audience experience that will keep them coming back for more.